Cliftons Brookdale is the largest cafeteria in the world. In 1931, during the Great Depression, a man named Clifford Clinton, due to his conflicts with his business partners, gave up his ownership in what had originally been his father's cafeteria business in San Francisco and moved to Los Angeles. There he set up Clifton's Cafeteria. 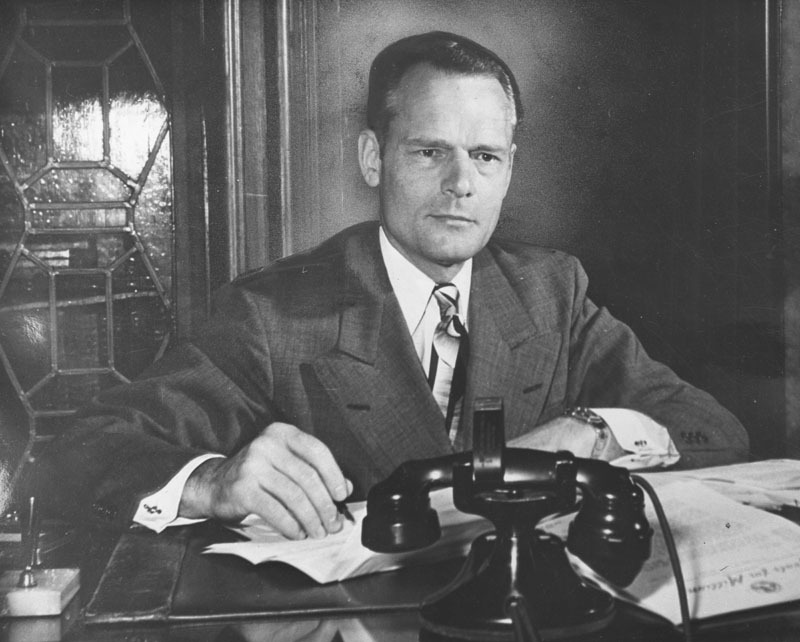 Clifford Clinton never turned away anyone who was hungry despite their lack of money, and during the Depression he gave away many a free meal to his cafeteria's guests. His restaurants had a "Pay what you wish" policy and even at at least one of his restaurants had this slogan up in neon outside advertising this feature of the cafeteria. By 1935, he opened a second Clifton's at 648 South Broadway. This was called Clifton's Brookdale and it was modeled off of the Santa Cruz mountains and named after the Brookdale Lodge. Like the aforementioned Lodge, Clifton's Brookdale also had a stream running through the dining room, plus a twenty foot waterfall. Redwood trees covered up columns in the cafeteria and a life sized forest was set up as a mural on one of the walls. A fishing bear, animated animals, and a moose head also adorned the restaurant. 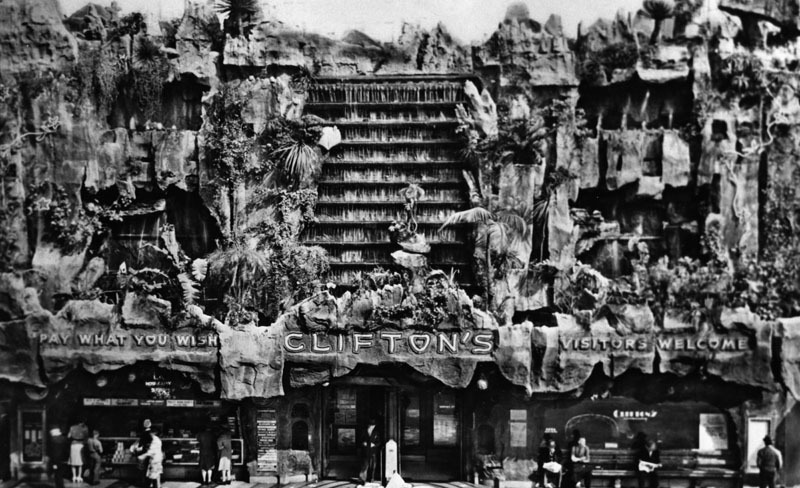 In 1939 the original Clifton's Cafeteria located at 618 South Olive Street was completely renovated into a three story tall South Pacific restaurant called Clifton's Pacific Seas; the outside featuring waterfalls, jungle, geysers, cliffs, and lots of tropical plants. It was an excellent example of programmatic architecture. The restaurant was one of several Clifton's Cafeterias, but was certainly unique for its theme. There was also a rain hut in the restaurant where it rained every twenty minutes. Additionally, located downstairs was a Garden of Meditation featuring a statue of Jesus Christ. It had the aforementioned "Pay what you wish" policy and neon sign outside. Jack Kerouac visited the location and wrote of it in his novel On the Road. The restaurant sadly closed in 1960, and the location is now a parking lot. Clifford Clinton and his wife sold the cafeterias to their children and eventually additional branches opened up in Lakewood (1956 - 2001), West Covina later renamed The Greenery (1958 - 2003), Century City (1966 - 1986), another Los Angeles location called the Silver Spoon (1975 - 1997), Laguna Hills (1987 - 1999), and Woodland Hills. 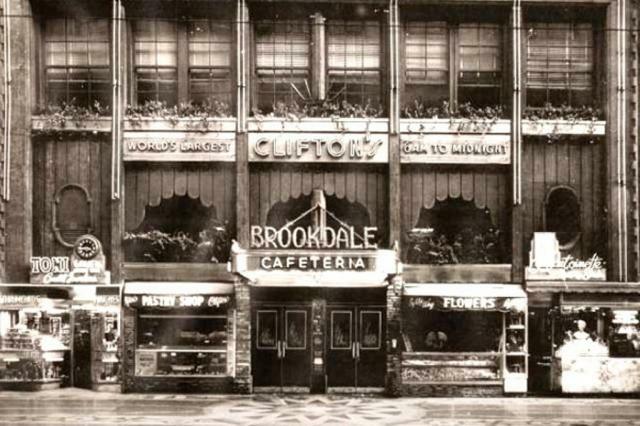 Clifton's Brookdale still stands today. It still has the similar motto, "Dine Free Unless Delighted", and boasts 600 seats over three floors making it the largest cafeteria in the world, in addition to the oldest cafeteria in the Los Angeles area. But in 2010 the restaurant was sold to Andrew Meieran and it is no longer in the Clinton family. In September 2011, Meieran closed the location for renovations and has yet to reopen it. However, in the process of renovating, a neon sign was discovered walled up behind a women's restroom, plugged in and still turned on. It was estimated that the sign ran for seventy years before being found, still lit. It is believed that having the sign on for the seventy years cost about $17,000 in electricity. Hopefully soon, Clifton's Cafeteria will reopen in all its Brookdale, waterfall, stream flowing thru the dining room majesty. Photos from Los Angeles Public Library Photo Collection and Clifton's Cafeteria.